Apiary (eh-pee-er-ree) is a place where bees are kept, a collection of bee hives. We envision Apiary to be a sweet spot for specialty desserts and ice cream. Travis Goh and Brian Lee makes Apiary. Travis makes the ice cream and pastries while Brian handles the business end of the creamery. We believe that only by using quality, natural and fresh products, then we will be able to create ice cream that is of the highest quality. It's really that simple. All our dairy products are pasteurised on site in our tiny kitchen. 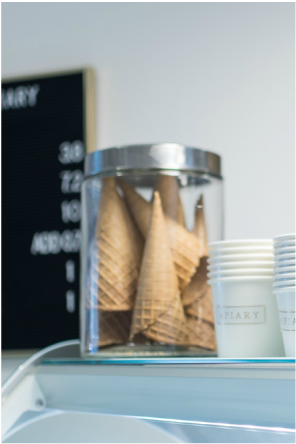 In the production process, no artificial flavours or colourings are added to our ice cream to produce that smooth creamy and rich flavours that is synonymous with all APIARY ice cream and sorbets. What's a better way to impress your guests than ice cream? Ice cream and espresso booths are available for rental.